I love to travel and have been super lucky to be able to do a fair amount of it over the past ten years. In fact, I just returned this week from visiting family in Alaska, which is what inspired today’s blog post! One thing I have learned from traveling is that it goes so much more smoothly when you simplify whenever possible. For almost every trip I’ve taken, including a two-week trip to Europe, I traveled with only a carry-on. It’s not always easy, but it’s cost-effective, has always been manageable, and I’ve been glad I did it every time! 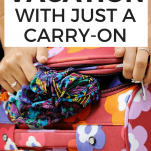 If you’ve got a trip coming up, you’ll definitely want to check out these tips to pack for vacation with just a carry-on! If you’re only going to pack a carry-on for your vacation, you’ll have to be extra sure to find the right bag. First of all, you’ll want to make sure whatever bag you use fits the airline’s requirements for carry-on items. This means making sure the bag is small enough to comply with their requirements, while also being large enough to fit everything you need. Since you’ll also be bringing your carry-on with you through the airport, you’ll also want to make sure it’s an easy bag to transport. This probably means either something with wheels or something you can wear on your back. When I did two weeks in Europe with just a carry-on, I brought everything in a backpack. On my most recent trip to Alaska, I went with a suitcase with wheels. I always feel way more organized when I write things down, so whenever I’m packing for a vacation, I always make a packing list ahead of time. I’ve been doing this literally since I was a kid and we would go on family vacations. The major components of my list are made up of clothing and toiletries, and then I’ll be sure to add any other items I’ll need such as chargers, my Kindle, and anything else I might need depending on where I’m going. Making a list ahead of time makes packing a breeze and since I’m spending a few days going over it before I actually pack, I feel like I’m less likely to forget anything. If you’re packing for an extended trip in just a carry-on, you’ll have to come to terms with the fact that you can only pack so much. Because of this, focus on packing pieces of clothing that you can repurpose. If you can get away with wearing the same pair of shoes every day, that is ideal. It’s also super easy to reuse pieces like jeans, sweaters, etc. I was only in Alaska for 5 days so I wasn’t worried about laundry, but for a longer trip, you can definitely pack fewer pieces and then wash halfway through! My wardrobe is made up of almost exclusively black, white, gray, and navy, so this one is probably easier for me than it is for most people. When it comes to packing with limited space, it’s definitely better to think in terms of outfits rather than individual pieces of clothing, and this is much easier to do when everything in your suitcase matches everything else! This will also make it easier to repurpose items like I mentioned above. Plus I find neutral clothing to be more versatile, which will be helpful if you’re going to be hitting up spots with varying dress codes. When you’re making your packing list, be realistic about what you actually need. I tend to overpack, so I always like to really think about my destination and whether I’ll need all the items on my list. On my most recent trip to Alaska, I knew I was going to be spending most of the time outdoors hiking and traveling, so I knew packing any makeup would have been a waste of space in my suitcase. I also didn’t bother bringing anything besides very casual clothing, because I knew that would work everywhere we went. Don’t forget that when you’re traveling via plane, you’re allowed to bring one personal item in addition to your suitcase! For me, this means a purse, and I always make sure to take advantage of that space. My purse is typically reserved for anything I may need on the day-of while traveling such as my wallet, a book, snacks or a water bottle, and earbuds. The personal item just has to be small enough to fit under the seat in front of you, so this could also include a briefcase, laptop case or small backpack. When it comes time to actually packing your bag, really think about the best way to do so. First of all, condense your clothing as much as possible. I find that rolling clothing rather than folding helps to take up less space. Also, pay attention to where in the bag everything is going. If there’s anything you may end up needing to take out while you’re traveling such as a sweatshirt to wear on the plane, or your liquids for while you’re going through security, put those things on top so they’re super easy to get to. How do you pack for vacation? Do you check luggage or stick with a carry-on?